1 cup Gorgonzola crumbles1 1/2 cups shredded (a little larger than grated, available in tubs) Asiago or Parmigiano-Reggiano. Thick sesame bread sticks, for dippingCelery hearts, trimmed for dipping. Pita crisps with Parmesan and herbs. Preheat oven to 400 degrees F. Defrost spinach 10 min on Defrost setting in microwave oven then drain well by squeezing out in dish towel. De-ice artichokes as well, 6 min on Defrost in oven then wring out & finely chop. Heat a sauce pot w/ butter over medium to medium-high heat. Add garlic to melted butter & stir 1 to 2 minutes, then sprinkle in flour & combine 1 minute more. Whisk in stock & milk and season w/ salt, pepper and nutmeg. Thicken 2 minutes then transfer from heat and melt in Gorgonzola. 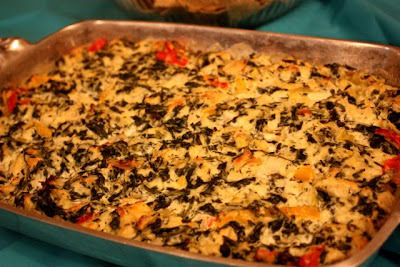 Stir in spinach and artichokes and half the shredded cheese then transfer to a small casserole and top w/ left over cheese. Brown & bubble in the oven for 10 to 12 minutes. 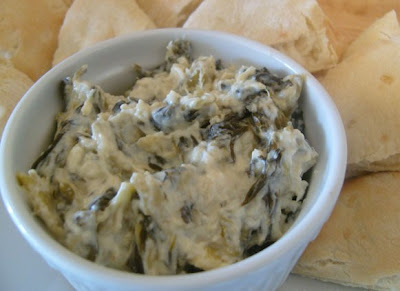 Serve with bread sticks, celery hearts & pita crisps for dipping. Rub jalapenos with olive oil and salt; broil until dark spots appear on a crackling skin. Finely chop jalapeno, shred artichokes and spinach. In a bowl, mix ingredients and transfer to a buttered shallow serving casserole dish. Top with cheese shreds and strips of roasted red peppers in olive oil. Broil until top is bubbly. Blend well cream cheeses, sour cream and garlic. Sum Up peppers, onions, salt, artichokes & spinach. Mix very well. Spread Out in greased baking dish. Broil at 350 for about 20 minutes or until heated through and cheese is melted. Enjoy! 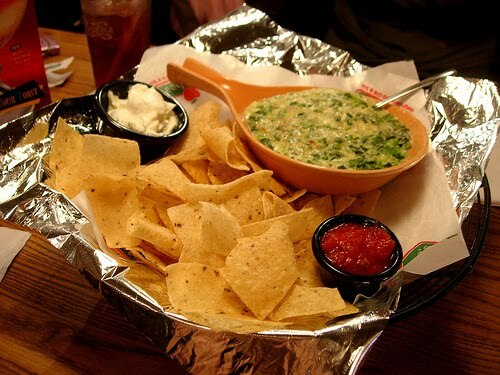 Serve Up with tortilla chips or crackers. Preheat oven to 350 F. Blend all ingredients together in a bowl & ready mixture into a small baking dish. Bake for 25 minutes or until cheese sets out to bubble. Serve Well with chips of choice or sourdough bread. 1 bag shredded (~12 oz) cheese blend (such as asiago, provolone, Parmesan and mozzarella) - reserving a handful for sprinkling on top before baking. Crackers, sliced baguette, pita chips, or veggies for dipping. In a large bowl blend chopped up spinach, artichoke hearts, & lemon juice (& a few drops tabasco if desired). Set aside. Lightly saute the sliced onion in olive oil til nearly translucent & add garlic 1 minute before removing from heat. Add fried veggies to spinach/artichoke mixture. Add the mayo, sour cream, & cut up cheese til well-blended. Spread into an oiled casserole dish, sprinkle with a handful of leftover cheese and bake at 350 til lightly brown & bubbling, about 45 minutes. In a huge bowl, mix the the cream cheese with the sour cream w/ a wooden spatula until well blended. To the mix, add in the cheeses, garlic, salt. Close in the artichokes & spinach. Pour mixture into a pre-heated crock-pot/slow cooker, cover & make up on HIGH for more or less 2 hours. Serve w/ more or less toasted cut baguettes, pita bread, white corn tortilla chips, your favourite veggies or crackers. 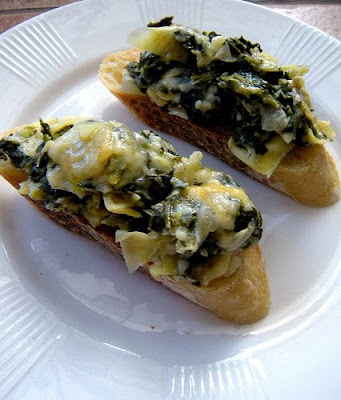 Thaw the spinach in the microwave oven and mix with the drained artichoke hearts in a casserole dish. mix in the cheese. 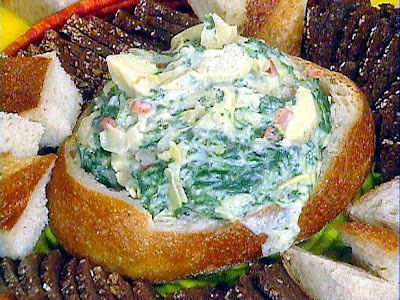 Soften the cream cheese in the microwave oven & mix with the sour cream, mayo and garlic. 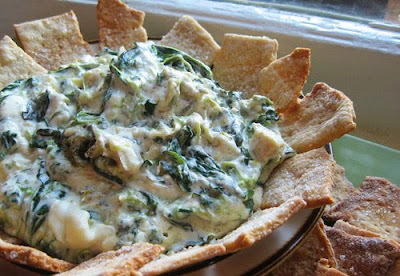 stir the cream mixture into the spinach and artichokes until everything is glazed. Bake at 375 F for 20-30 minutes.